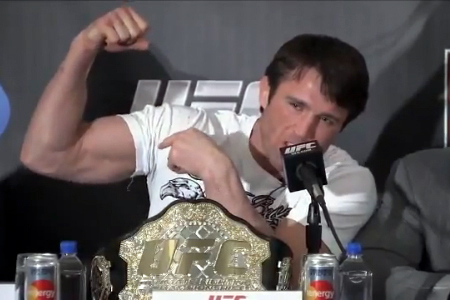 While his title had not seen the light of day prior to Wednesday, Sonnen and his bling-bling belt sure made up for lost time during today’s “UFC on FOX: Evans vs. Davis” press conference. When asked if Sonnen intended to walk down the aisle on Saturday with the strap wrapped around his waist, Sonnen avoided answering while providing a WWE-esque response. “It’s my belt, I slept with this thing last night,” he shared. “You’re lookin’ at the reflection of perfection, the one that gets all your attention. You’re lookin’ at the man with the biggest arms, the man with the greatest charm, and the man in Chicago to do a lot of harm to a guy three doors down. When a fan posed a question to Phil Davis, Uncle Chael couldn’t help but interrupt after hearing his name involved in the inquiry. “I apologize for chiming in,” Sonnen said. “Were you talking to the world’s toughest man or did that get referred down to Mr. Davis, because I’m not sure. Maybe I can ask you a question, maybe I can ask three of Michael Bisping. First, whatcha gonna do when you know who, how you gonna deal with the man of steel, how will you react to Sonnen’s attack? Chael P. Sonnen, ladies and gentlemen.